The newest entry in PONOS’world-famous“Mr.”series!! Test your skill in the ADVENTURE MODE. Can you defeat the Cosmic Gang and save the Shogun? Wild new levels, boss fights, and more! Stylish alien-slicing ninja action - now accepting challengers, no experience required! １ Tap the screen at the right moment! ２ Strike down all Aliens - don&apos;t leave a single one! ３ Perform your "Special Move" for maximum damage! １ Collect power-up items as you play the game. ２ Combine your Ninjas to instantly level up your favorite character! ３ Watch your Ninja evolve to its ultimate form at level 30! Will you dominate your friends this week?! Or cooperate with them get hearts?! Why not both? Link up with other players using Facebook for the full Mr. Ninja!! Fever experience! Summon the right familiar to maximize the effect of your play style! That’s enough talk - let&apos;s get to playing "Mr.Ninja!! Fever"!! 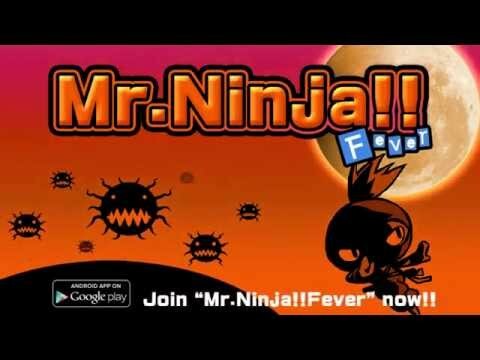 ※Internet connection is required to play "Mr.Ninja!! Fever"
※This game is free to play, but features bonus content available for in-app-purchase.